I had a few chances to get back to Kansai where my home town is in the past few days. I used to get on Hankyu Railway while I’d been in Hyogo pref., but now it is better to use JR West line for me because of easily access if I’ve got on Shinkansen, is the bullet train in Japan, when I get back to my home town from Tokyo. 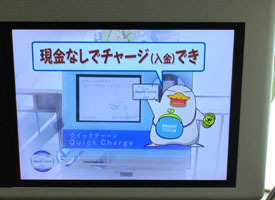 I always enjoy to watch the information display, which ran some commercials and information, on the ceiling inside a car. 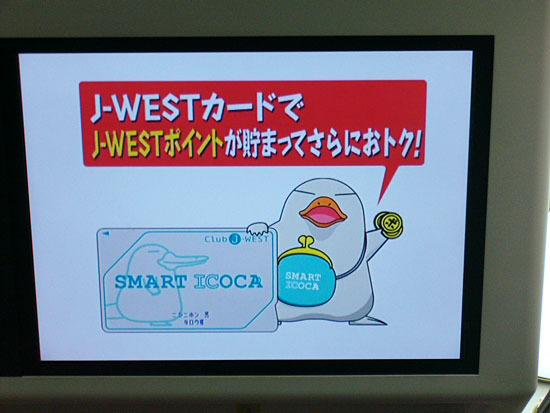 I found a unique commercial for ICOCA card, is a prepaid card for JR West. 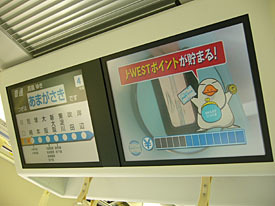 A unique platypus character, named “Ico-chan”, introduced ICOCA card to the commuter how useful it was. Ico-chan explained about the ICOCA card with call-outs and subtitles. The subtitles used typeface “Take”, which means “bamboo”. “Take” has really unique straight strokes, but the skeleton is not stiff and really natural to my eyes. “Take” have Japanese taste and casual feelings so I would like to use it for package designs such as for Japanese snack foods or tea. The typeface “Take” won the silver prize of Morisawa award 1993, which had been designed by him and was released as one of Morisawa Liblary last year. The Take’s type designer Mr. Naoyuki Takeshita knows typefaces well about not only Japanese font also Latin typefaces, he taught me what the typeface was immediately when he and I hanged around downtown together. He has his blog and posted several photos on Japanese typefaces which he found in downtown where he hanged around. Called “街でみかけた書体: Machi de mikaketa Shotai”, means the typeface which he found in downtown, is really interesting blog post. It was a pity it is Japanese language only, but you can see several kind of Japanese typefaces on the blog.